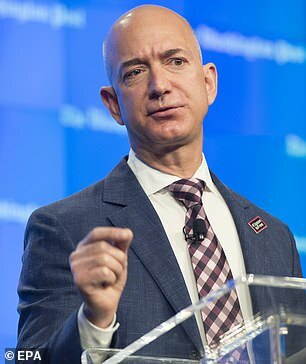 Elon Musk is slamming Jeff Bezos as a copycat after the Amazon CEO announced his rocket startup’s plans to launch 3,000 internet satellites into space. Bezos, the richest man in the world, founded aerospace manufacturer and spaceflight services company Blue Origin in 2000. On Tuesday it was reported Blue Origin is launching Project Kuiper to send a constellation of about 3,000 satellites to orbit at three different altitudes to provide internet access under-served areas across the globe. The initiative, that would reach about 95 percent of the globe, was revealed in federal filings. 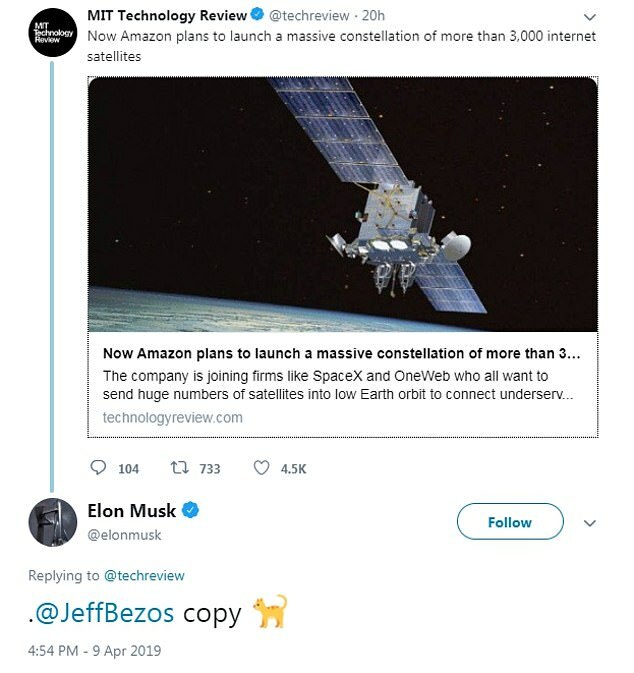 When the MIT Technology Review reported the story, Musk replied with tweet directed at Bezos himself with the word ‘copy’ and a cat emoji. 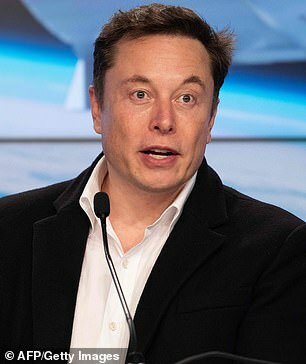 Musk’s own private rocket company SpaceX already launched two prototype satellites into orbit after it received U.S. approval for its own plan in February 2018, according to Fox Business. The project, called Starlink, is designed to create a network of roughly 12,000 internet-beaming satellites. Musk said the intention of the satellite network was to provide global broadband to ‘serve [the] least served’. 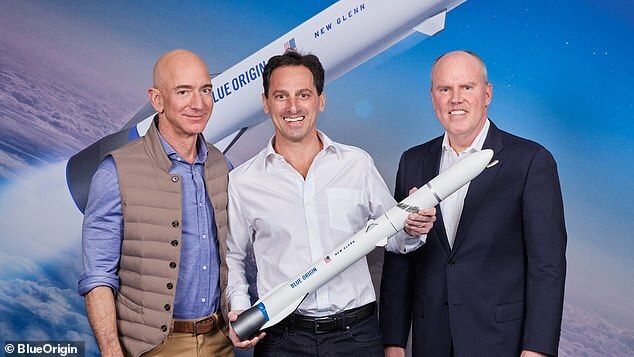 According to CNBC, Bezos had hired SpaceX’s former vice president of satellites Rajeev Badyal, who led the Starlink project to spearhead his Blue Origin’s own project. Badyal was fired by Musk who became inpatient with the space of development. But this isn’t the first time that Musk has hit at Bezos in his venture into space. 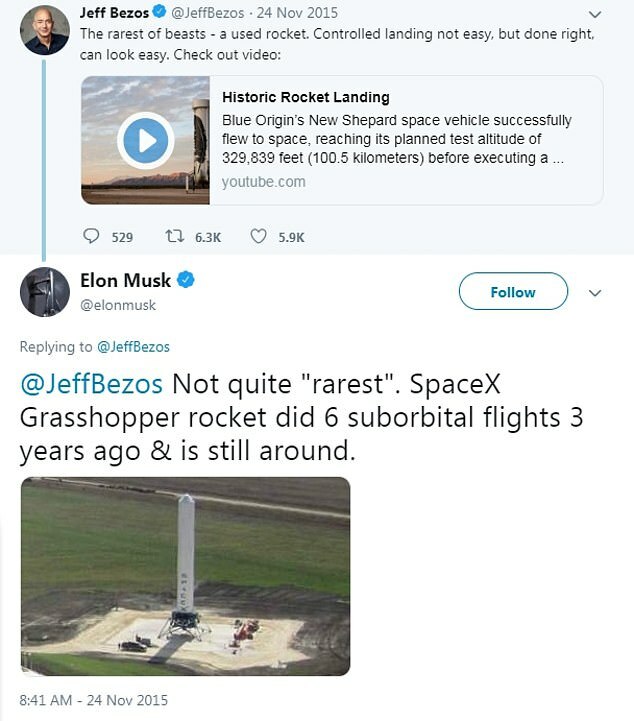 In 2015 when Bezos proudly posted a video bragging about Blue Origin’s successful rocket launch in 2015, Musk replied with a video of his company’s Grasshopper rocket who achieved the same feat three years prior. Bezos wrote his rocket was ‘the rarest of beasts’. Project Kuiper will send 784 satellites at 367 miles (591 kilometers), 1,296 satellites at 379 miles, and 1,156 satellites at 391 miles, according to a filing with the International Telecommunications Union, as per the Technology Review. ‘This is a long-term project that envisions serving tens of millions of people who lack basic access to broadband internet,’ an Amazon spokesperson said on the plan. It’s not clear when these satellites will be able to provide internet as they need to obtain approval from the U.S. Federal Communications Commission first. Musk and Bezos aren’t alone in their pursuit of building an internet satellite fleet, Facebook is reportedly pursuing similar plans.